It's the diet of legend in the gut-healing world. Restricted to bone broth, cooked vegetables, and sauerkraut juice, the first phase of the Intro Diet is intensely healing… and intensely difficult. And yet, it is designed to heal and seal the gut wall quickly. For those of us who've gone through it successfully, it almost feels like we should belong to a special club or something, especially those who needed the first phase for more than a couple of days. What Is The GAPS Introduction Diet? …[T]ry not to be tempted to skip the Introduction Diet and go straight into the Full GAPS Diet, because the Introduction Diet will give you the best chance to optimise the healing process in the gut and the rest of the body. I see cases where skipping the Introduction Diet leads to long-term lingering problems… (Gut and Psychology Syndrome, page 144). There are six phases of the Introduction Diet, each building upon the last in terms of adding foods back into the diet. 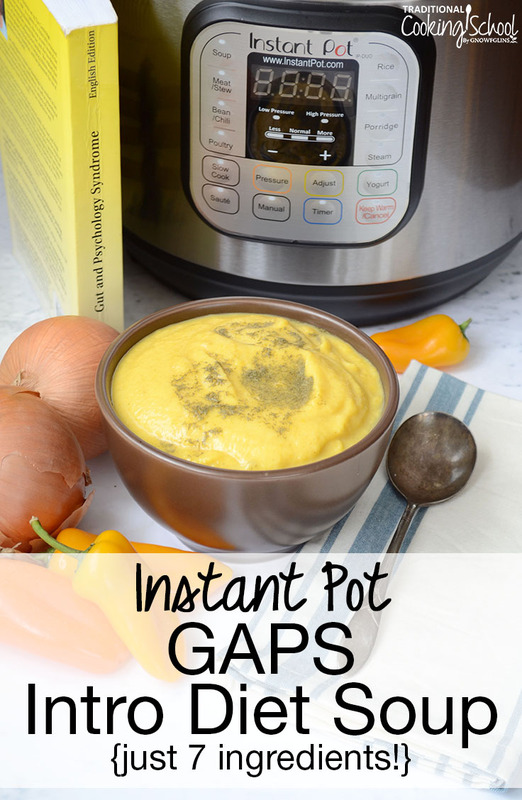 This Instant Pot GAPS Intro Diet Soup is suitable for all six phases! Especially that first phase which is so limited. Why not make it easier on yourself by using your Instant Pot?! Pressure cooked vegetables are more nutritious because they are cooked for less time than boiled or roasted vegetables. Plus, in the Instant Pot, they're able to be cooked under less heat because of the pressure. This truly is the best way to cook vegetables for easier digestion while retaining as much nutrition as possible! The GAPS Intro Diet is hard enough, so why not make it easier on yourself with your Instant Pot? This nourishing 7-ingredient Instant Pot GAPS Intro Diet Soup is full of nutrient-dense cooked veggies and bone broth and takes just 6 minutes! Add the squash, cauliflower florets, onion, pepper, broth, and fat to the stainless steel insert of your pressure cooker. Place the lid on, checking the seal and making sure the vent is sealed. When cycle is complete, turn off (if electric cooker) or remove from heat (if stovetop cooker). Quick release pressure. Add the garlic cloves to the pot. 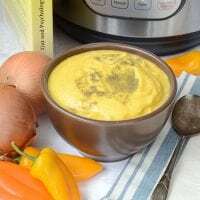 Using an immersion blender, blend the soup to your desired consistency. *If you have any cooked marrow, blend it into this soup before serving. *Add 1 to 2 teaspoons sauerkraut juice or juice from another ferment and/or sour cream to the top of the soup just before serving. *In later stages of the Introduction Diet, you can add fresh avocado, roasted meat, or a drizzle of olive oil to this soup. Are you on the GAPS Diet? Are you using your Instant Pot to make it easier? i’ve been making stock in my IP for over a year on a regular basis (we raise our own pastured, gmo and soy free chickens)- i usually cook it on HI for 180 minutes because i thought this was the recommendation to get the most gelatin and other nutrients out of the meat bones and other pieces. is that not the case? others have recommended 120 on LOW, and i cannot recall where i read the longer the better… maybe from when we used to use slow cookers? Is there any information on the ideal pressure and cook time? I have heard high at 120 minutes is best. But also the GAPS diet does not allow bone broth until the later stages. You can only use meat stock in the intro diet. Meat stock is meat with bone in it cooked for a short period of time in a pot with water or 6 to 8 hours on low in a crock pot.